The light color indicate moderate refill cask influence, but the quality of the spirit is superb. Sweet but a little bit sharp without water. Undertone of sherry, more on ripe red berries and bitter chocolate. Juicy sweet arrival followed by a solid build up of spice. Big, bold and "dark" body of red fruits and chocolate. On the edge of long. Neat it goes a little bit dry but retains some fruity sweetness. Raspberry jam on the death. My previous Clynelish from a sherry keg had a fundamentally different character. Overall, I think the filling is quite unusual but in relation to the selling price also (too) unspectacular. First closed, the alcohol is clearly noticeable; sweet, yellow fruits over time - peach liqueur, yellow plums, pear; a floral "Clynelish" note is noticeable; with some water you can find some acacia honey and vanilla in addition to the yellow fruits. The alcohol dominates first and produces sharp tingling, then: sweet and creamy, some yellow fruit, a little honey, milk chocolate and finally bitterness; slightly astringent. Drying, quite short and unspectacular finish with a little bitterness. This was a sample courtesy of Peatbogger. If nothing else I can appreciate the quality of the spirit. 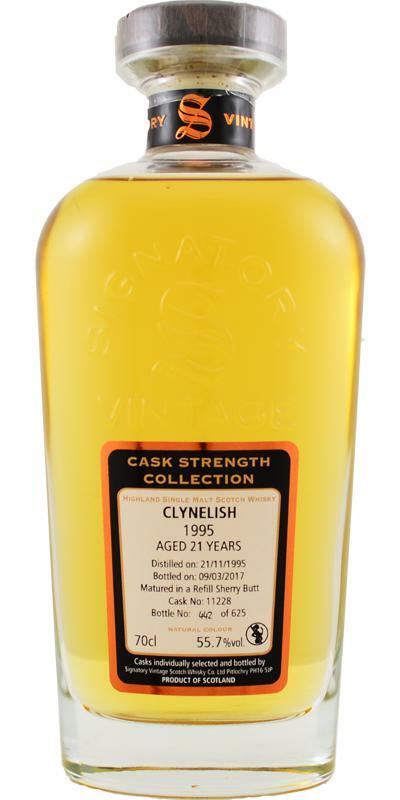 I have come to the conclusion, Clynelish just isn't for me which probably puts me very much in the minority. I find them far to much hard work. I just want to sit back and enjoy. I must say the nose on this is very faint, but I am picking up rose petal, banana candy, honeydew melon and golden delicious apple skin. Not much else really. The first sip and swill and all I get is heavy burn, bitterness and dryness. I have had trouble with Clynelish before. I find them hard work. The last bottle I had won me over eventually but that was past halfway down the bottle. A little water here,there, leave for a month, that kind of thing. This is a sample so I don't have much hope. Mmmmm second sip a little better which I was hoping for. Some butterscotch, bitter lemon, green tea and green apples this time. The finish is like biting into a Granny Smith apple, green and bitter but without the juiciness.